Back in the old days, queuing at the bank to withdraw money is tiresome. I remember once when I was in a boarding school in Pekan Pahang, I have to run back to my hostel because I forgot to bring my identification card when already at the bank. 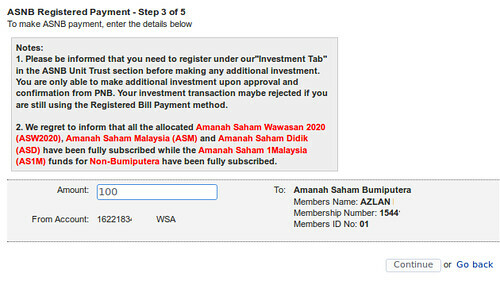 Nowdays, we are so lucky that bank use online transaction like Maybank2u and CIMBclicks. 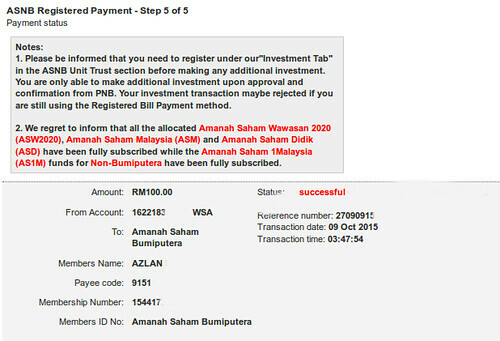 Today, I just want to share on how to send money to Amanah Saham Bumiputera or ASB. Since I am living abroad, usually I will transfer money to my father using Western Union and asked him to invest in my ASB account at Maybank counter. 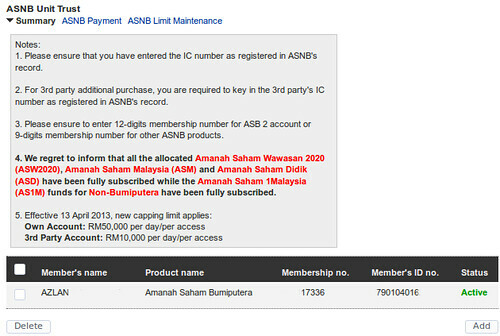 Then I read on Maybank2u that I can transfer online to my ASB account. That is good news, I don’t have to trouble my father anymore. I only manage to link my Maybank2u to ASB last September, when I flew back to Malaysia for short holiday. I also have to change my mobile number registered to Maybank2u because the old one already terminated. It is really important because, I need to receive TAC number for any transaction to be made except for Favorite account. Luckily, I manage to receive my TAC code even I am abroad. I use Umobile prepaid and need to top up every month to maintain the number. Here, my Umobile number is using Vodafone TR network. At first, I was quite skeptical using prepaid number to receive sms from Maybank2u and register a new line number is not an option. Even the guy that sold me the prepaid number was not sure, he even call his umobile agent to confirm. The UMobile told him that, I can receive sms from Maybank even I am abroad by maintaining balance RM50 on my phone. It easy to have RM50 balance because I cannot use it here, cannot call only sms. Lets focus back to Maybank2u and ASB. 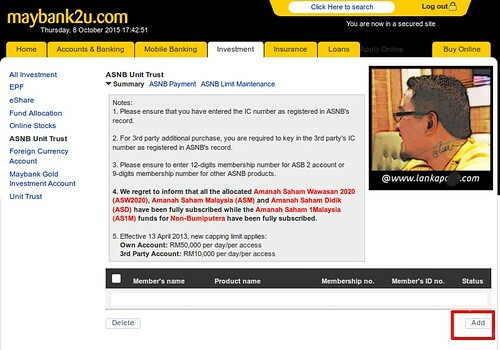 In order for us to transfer money to ASB online using Maybank2u, we have to register our ASB account into Maybank2u. Please have your ASB account book and handphone in front of you during registration. 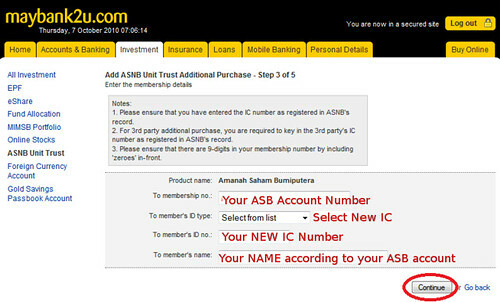 Login to Maybank2u.com and click Investment tab and select “ASNB Unit Trust” from the menu. Service fee for transaction money to ASB is RM 1 plus 6% GST = RM1.06. NOT 6% from the amount that you transfer to ASB. 6% GST is only charged from Service Fee only. Transaction after 5pm will be considered as next business day transaction. You can transfer money to third party account ASB holder. Let say you register your wife or children ASB account. Make sure you refer to your ASB account book, your name on the book and maybank2u must be the same. Confirm all the details displayed and fill in the TAC code received. Click “Confirm” to continue. When the Confirmation Status page is displayed, keep the record for your reference. 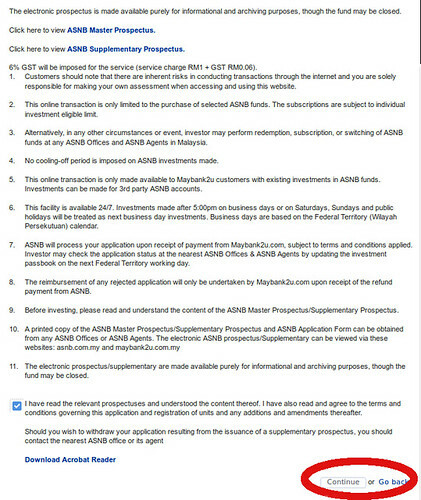 Your registered ASB account will be pending for approval. Usually it will take 36 to 48 hours. You can transfer money when you get Active green status. When the Payment Status page appears, click “Print Receipt” and keep it for your future reference. If any problem with the transaction, Maybank will reimburse your money not ASB. It will take 1 or 2 business days for the money you transferred to available on your ASB account, so be patient. My advice, try transfer with small amount. Then check, how long it will take or are you facing any problem during transaction before you can proceed with larger amounts. That’s all for now tutorial sharing from me. Hope you can invest and save money in your ASB account thru Maybank2u. Good luck. Can this be done through the M2U mobile app as well? can we make it as a recurring payment or SI to ASB? So we don’t have to do it manually every month.